Song is short, raspy trill that ends in one low, clear note. Description: Sexes similar. Gray central crown stripe; gray unstreaked nape; bright buffy eyebrow bordered above by dark stripe; diffuse grayish ear patch. 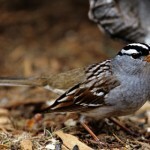 Dark brown upperparts with white striping on back; buffy breast and sides with diffuse streaking; white belly. 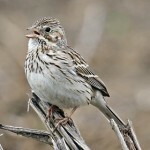 Juveniles are buffy overall with heavier streaking below; lack gray central crown stripe. 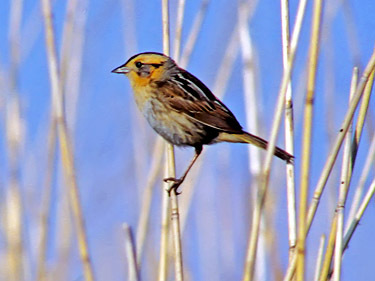 Habitat: Saltmarshes, lakeshores, and along wet edges of marshes and sloughs. 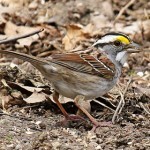 Where in Nebraska: Inconspicuous and seemingly rare spring and fall migrant in eastern Nebraska. Seen west to Custer, Cherry, and Sheridan Counties. Most of sightings are from Lancaster County. Field Notes: Usually found in wetter habitats than those used by Le Conte’s Sparrow. Fun Facts: Due to the secretive nature and unpredictable singing patterns, Nelson’s Sharp-tailed Sparrows are a hard species to learn about.